A Riverdale native, Abe Schacter-Gampel was a member of SAR High School’s first graduating class. He then studied at Yeshivat Maale Gilboa and Mechon Hadar and majored in Classics and Comparative Literature at New York University. 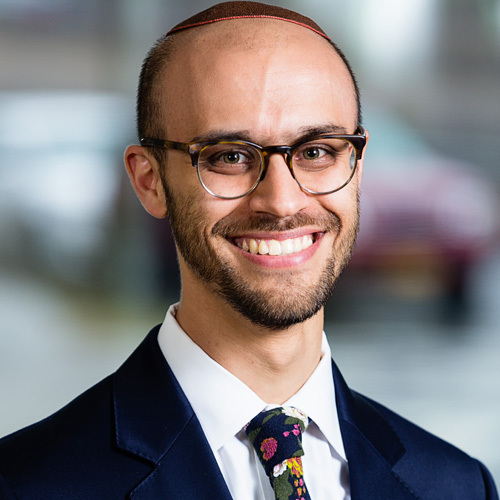 While at YCT, Abe interned at Bais Abraham Congregation in St. Louis, Hunter Hillel, and The Abraham Joshua Heschel School, and for two summers served as a Community Educator at the Genesis Program for high school students at Brandeis University. Abe completed his first unit of Clinical Pastoral Education (CPE) at Memorial Sloan Kettering Cancer Center and a year long CPE residency at Methodist LeBonheur Healthcare. Abe now serves as the Director of Spiritual Care at the Memphis Jewish Home and Rehab.